I had a wonderful Jazz Night Out when my friend Rick and I saw the sold-out Charlie Hunter Trio show at Natalie’s Tuesday night. On this tour, the great guitarist is joined by master percussionist Bobby Previte and up-and-coming trombonist Carly Meyers. Hunter and Previte have collaborated extensively over the years, often in formats that stretch the boundaries of jazz – when I saw them in a duo at the Beachland Ballroom in Cleveland in 2004, Hunter was playing his custom 8-string guitar and Previte was using an electronic drum set to create other-worldly (yet grooving) sounds. These days, the two are employing more standard tools of the trade, as Hunter played a (customized) 7-string guitar and Previte had a standard drum set, but they are still finding ways to innovate on the bandstand. Hunter played bass lines and guitar melodies simultaneously in a way that looked effortless, but produced amazingly fluid results. The setlist was largely unannounced, but was mostly comprised of originals, with a few arrangements (like a Bessie Smith tune and Lorde’s “Royals”) tossed in for flavor. The sounds ranged from clear-toned country & western numbers to gutbucket blues to uptempo soundtrack material, powered by a cohesive on-stage unit. All three musicians had several solo features, with Previte going into some deep, almost avant garde passages, and Meyers blowing some sturdy soul with her trombone. The night was two sets of heartfelt music of many stripes, played to a very attentive packed house. Hunter and crew seemed very appreciative, so I’m hopeful that April shows two years in a row can mark the origins of an annual Hunter tradition at Natalie’s. Thursday, April 16th (7 – 9pm): Adria Shahid at the Lincoln Theatre. The last installment of the 2014-15 Backstage at the Lincoln series gives the audience a chance to enjoy soulful jazz in an intimate setting on the Lincoln stage. Vocal stylist Shahid will bring her mix of classic melodies and timeless energy to an evening sure to delight fans of jazz and soul. Tickets are $10 and available here. Dave DeWitt grew up listening to Dr. John, Billy Preston and Joe Sample. He is the driving force behind THE SOUL’S show this Friday at Natalie’s featuring some of Dr. John’s most popular music. Dave’s soulful approach to jazz and R&B is unparalleled in Central Ohio. Phil Clark always delivers a powerful punch on vocals and harp. His raspy, gospel influenced voice lends itself perfectly to Dr. John’s tunes. Also featured Friday is Columbus legend guitarist John Boerstler, veteran bassist Jeff Ciampa and founder/leader of THE SOUL, Aaron Scott on drums. Scott advises that if online ticketing is sold out (only bar/standing room tickets are available at press time), call the Natalie’s box office at (614) 436-COAL to secure any remaining tickets. Tuesday, April 21st (7 – 9pm): Spotlight Series: Jazz 100’s: Billy Strayhorn featuring Dave Powers at Jazz Academy, 3rd floor of the Lincoln Theatre. JAG’s Spotlight Series “is designed to highlight the music of seminal composers, eras, and styles of jazz in an interactive setting that encourages curiosity and dialogue.” Tuesday’s program will present powerhouse pianist Powers and his trio paying tribute to pianist/composer Strayhorn in honor of the 2015 centennial of his birth in Dayton, Ohio. 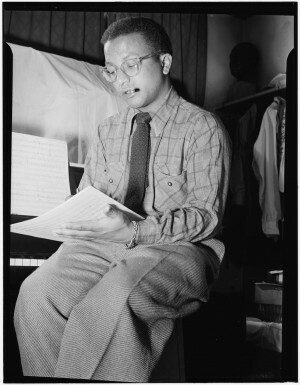 This event will combine performance and education as Powers discusses Strayhorn between playing his timeless standards. To register ($10) and find more information, click here.